Enjoy a stay in the Premium Valley view room. Bed tea/coffee, Breakfast and Lunch or Dinner. Complimentary pick-up/drop from railway station. Valley view Premium accommodation on twin sharing. Fruit basket once in the room. Complimentary drop once to “The Mall/Lift” 16:00 to 19:00. Children below 5-years are complimentary without bed. Package expendable on pro-rata basis, subject to availability. 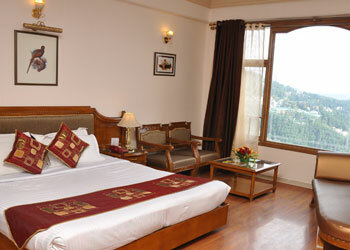 The Cedar Grand is a luxurious Shimla hotel located close to the mall, Christ Church, Jakhu hill, shimla state museum and numerous other tourist attractions in Shimla. Hotel is less than 5 minutes from the railway station. The Cedar Grand has 29 rooms and are a perfect blend of vintage ambiance and modern amenities. All the rooms are centrally heated, have cable TV, mini-fridge, hot water supply and bath tubs in bathrooms of super deluxe/mini suites and jacuzzi bath in royal suites. Hotel offers facilities like multi-cuisine restaurant, bar, free meals/arrangements for drivers, ample space for parking and travel desk and accepts all major cards. Distance from railway station: 0.5 km. Parking and accommodation for driver is complimentary.